A bottle of Jet perfume arrived from Dale Wilson for his mother’s December 4 birthday. He would graduate from Advanced Training at Roswell, New Mexico, in just a few weeks. “Thanks for the lovely birthday present you sent me!” Leora wrote from the Minburn farm. It had arrived right on the day. She tried it out right away but was keeping it in her box of handkerchiefs to make them smell nice. A woman had a collection of hankies in those days. Fancy ones–embroidered or with tatted lace edges–were saved for dressing up. Every birthday, Leora got one from her own mother. “Dale, we are sure proud of you! You are sure doing fine, and more power to you. You just do your best. You are going to like the twin-engine school, I’ll bet, after you get started, and it will be better than the single, as Delbert and the boys say they are better protected in combat.” Bombers on missions were protected by squadrons of fighter planes. Leora wrote that they hadn’t heard from Delbert for over a month. “My, I hope we hear from him soon.” She figured he must be on a long trip. “I suppose he is OK, but would be awful glad to get a letter. Delbert’s ship, the tanker USS Maumee (AO-2). Clabe and the boys had been sorting hogs and were getting calves ready for the vet. They’d been to see the John Wayne movie “Flying Tigers,” about the volunteer aviators who flew on behalf of the Chinese against Japan before Pearl Harbor was attacked. Newsreels of the war were always shown before movies. On December 7, a year after the attack on Pearl Harbor, it was finally announced all the damage the Japanese had done that day, and the ships and lives the country lost. “Makes everybody want to wipe every Jap off the face of the earth,” Leora wrote. “All of the story is in this Sunday paper and pictures taken at the time, 19 ships sunk or damaged, including 8 battleships–15 of the ships will go back and some are all ready in service.” Don’s battleship California was one of them. 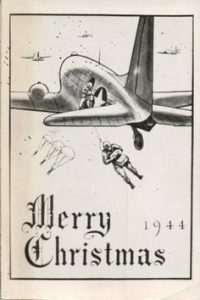 The mail included a Roswell Army Flying School Christmas card, with silver pilot’s wings embossed on a holiday scene. Dale’s neatly penned letters were now written on Flying School stationery—a ferocious eagle diving with a torpedo, with a formation of advanced trainers flying over. Every day–though busy with chores and picking corn–the Wilsons looked and hoped for a letter from Delbert. Every week, they kept writing to him. And worrying. Doris road the M&St.L train home from Des Moines on Christmas Eve. The next day, after the farm chores were done, they all drove over to Darlene and Sam’s near Earlham. Leora stayed with baby Richard while the rest spent Christmas ice skating on the pond, even Clabe. Sam and Darlene Scar, with baby Richard in the basket. 1942, Minburn, Iowa. The Wilsons listened to Bob Burns on a radio Christmas special, and Spike Jones and his City Slickers. Bob Hope’s WAAC headquarters show was broadcast from Fort Des Moines. Donald had nearly gotten married but decided it would be better to wait until after the war. Just a gamble, like everything else, he said. The “here today, gone tomorrow” lifestyle isn’t good for a marriage, and he liked traveling too much to stay put. Iowa ended 1942 under a glare of ice after two days of rain on top of snow. Clabe and Junior had slid into a ditch with the tractor and it took two hours to get it out. They vowed to leave it in the shed until things got better. But they still had livestock to feed, so Leora also had muddy overalls to wash. In winter she hung the laundry in the house to dry. That December, Donald was in Bremerton, Washington, assigned to help refit the USS California. Doris lived in Des Moines and worked at Bishop’s cafeteria. Darlene was busy with two-month-old Richard on their farm near Earlham. Dale was in his last weeks of pilot training in Roswell, New Mexico. Danny was still at Minburn, waiting for his call to the Army Air Corps. Junior, that year’s high school graduate, could hardly wait until he was old enough to join up. But where Delbert might be kept them all uneasy. The way you tell this story is riveting. I found myself holding my breath. I imagine that is just what the family was experiencing back then. I hadn’t written this story, but have Christmas 1943 ready for Monday. Things are even harder then. ‘Ice skating on the pond for Christmas’ , I can remember doing that; the baby in the basket and waiting for news from Delbert…a fabulous post Joy! I’ve never even ice skated! Thank you! Lovely story! What a handsome aviator! All five brothers were handsome! Thank you! I was 6 months old that Christmas (1944), and living in Marfa, Texas! Dad was still an instructor there. Thanks for letting me in on part of you story!! I have one ready for my birthday next year, but it’s about the U-boat captured that day. And that you can still tour. It’s at the Chicago Museum of Science and Industry. Quite a story. It’s so amazing to be able to put together the letters, stories, pictures and history from the internet, and imagine what it must have been like. Your grandpa, as the oldest in the family and also because of his take-charge personality, held things together after the war. Even after they moved to California. My mother was always so grateful for the way he cares for all of them.